Stars: Jason Momoa, Amber Heard, Willem Dafoe, Patrick Wilson, Nicole Kidman, Dolph Lundgren, Temuera Morrison, Yahya Abdul-Mateen II, Michael Beach, Randall Park, Graham McTavish, Leigh Whannell, Otis Dhanji, voices of Julie Andrews, John Rhys-Davies, Djimon Hounsou. For a long time, DC comics attempts to rival Marvel and its successful Avengers franchise through the creation of its DC Extended Universe with the Justice League have fallen a little flat, and their movies have tended to be dark and dour affairs. The exception was the stand-alone origins story for Wonder Woman, which was easily the best film. Now DC try to replicate that success with this origins story for Aquaman, who was originally created in 1941 by Mort Weisinger and Paul Norris. Aquaman is played by Jason Momoa (from Game Of Thrones, the 2011 remake of Conan, etc), who made his first appearance in the role as part of the Justice League in 2015’s Batman V Superman: Dawn Of Justice. Now the character gets his own stand-alone origin movie, but this ambitious, special-effects heavy film is a glorious and bloated mess crammed to the gills with plenty of disparate plot elements. It is also something of a major disappointment. We learn how, in 1985, lonely light house keeper Tom Curry (Temeura Morrison) rescued a wounded sea princess Atlanna (Nicole Kidman) and nursed her back to life after finding her washed up on the rocks during a storm. The pair fell in love and had a baby together, named Arthur Curry, who is destined to become the king of the underwater kingdom of Atlantis. But when some mysterious warriors from the underwater kingdom rock up armed with technologically advanced weaponry, Atlanna is forced to reluctantly leave the young Arthur in the care of his father and return to Atlantis. Arthur is aware of his special powers, but he prefers to live in the human world. He is part surfer dude and part sea faring vigilante who thwarts pirates attempting to hijack a nuclear submarine at sea. But when his evil half-brother Orm (played by Patrick Wilson) tries to take over the underwater kingdoms and attack the human world Curry is convinced by Princess Mera (Amber Heard, from 3 Days To Kill, etc) to return to Atlantis and fight to protect the kingdom and live up to his legacy. To defeat Orm Curry has to find a magical trident. He is reunited with his former mentor Vulka (Willem Dafoe, from The Florida Project, etc), a sort of underwater trainer who taught Arthur how to harness his powers. But he is also being pursued by a bitter and powerful enemy in Black Manta (Yahya Abdul-Mateen II). Aquaman marks something of a change of pace for director James Wan, who is best known for his horror franchises like Saw and The Conjuring series. Wan did flex his muscles and establish his action movie credentials with his helming of the seventh instalment of the Fast & Furious series, and he does stage a couple of exciting extended, physically punishing fight sequences here. He also brings a lighter tone and touches of humour to this film that shows that DC are learning a trick or two from their Marvel rivals. But his pacing is uneven and there moments in the overly generous 143-minute running time that flag. 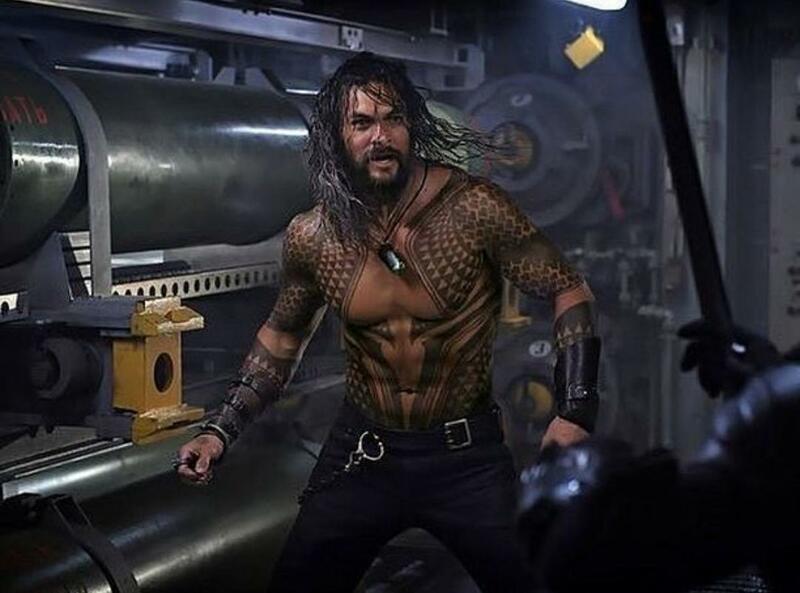 Aquaman is something of a mess, with an uneven script cobbled together by a team of four writers, including Wan himself, David Leslie Johnson-McGoldrick (The Conjuring 2, etc), tv writer Will Beall (Castle, etc) writing his first feature script, and Geoff Johns (tv series The Flash, etc), who is one of the former creative forces behind the whole DC Extended Universe concept. The dialogue is often clunky and wooden. The complicated plot concerns the origins of the character, underwater dynasties, ancient feuds and allegiances, politics, environmental messages, and an attempt to dominate the world. Momoa has the perfect physicality to carry off the role, even though, with his long locks, beard and heavily tattooed body he bears little resemblance to the clean-cut comic book character. The charismatic Momoa has a knowing wink to the camera as he delivers plenty of dry one-liners, and he does his best to carry the film through its waterlogged sequences. And his character is nowhere near as glum and moody or as flawed as either Ben Affleck’s Batman or Henry Cavill’s Superman. Wan has certainly assembled a strong ensemble cast, including Oscar winner Kidman, who is cast against type, and Wilson, who is a regular in his films. As well we get Dafoe who seems lost amongst all the green screen work, and Dolph Lundgren, who appears as King Nereus, the rule of another underwater kingdom who urges Orm to take control of all the kingdoms. However, most of the characters are cliched and one dimensional. The reputed $220 million budget can be seen on the screen with its spectacular CGI effects and impressive visuals that bring to life the colourful underworld kingdoms. However, the bonkers climactic undersea battle featuring a variety of exotic sea creatures – crab monsters, Atlantean fish-men, giant seahorses and great white sharks – is overwhelmed by the CGI effects and is underwhelming. Much of the film was actually shot in Australia with most of the special effects and visuals created down under as well. Production designer Bill Brzeski (Iron Man 3, etc) has done a good job of creating the technologically advanced undersea kingdom of Atlantis. Cinematographer Don Burgess (Forrest Gump, Contact, etc) has ditched the usual gloomy colour palette of previous films for a brighter look, and this is easily the best looking of the DC films to date.